Back in the Remix Age. That was right after the Bronze Age, I believe. It's that time again! As with almost every single before it, The Age Of Love gets its very own remix disc, featuring retoolings by some of the industry's most exciting or up-and-coming techno talent! 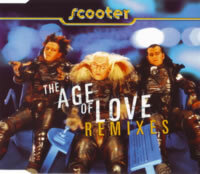 Surprisingly, this would actually be the last remix disc Scooter ever released, so I suppose by this point, interest was waning. Well, let's waste no time and dive right into those mixes, shall we? We start with the S/M In Motion Remix, a very by-the-books trance outing, which develops via a very familiar trail of standard beats, thumpy bassline, and in-your-face synth for the main melody of the song. If it's straightforward, unoriginal dance music with no discernible spark you're looking for, look no further. I don't think they tried very hard with this one; must have been a last minute affair. DJ Errik's Destruction Mix starts out in a similar fashion, and it worries me. A funkier bass, however, strikes soon, and suddenly things are feeling a tad groovy. Interestingly enough, it isn't until almost four minutes in (more than halfway through) before anything even closely resembling The Age Of Love rears its head, and even then, it's just a brief symphonic interlude before DJ Errik returns to his mix of apparent destruction. It is, more or less, its own separate composition in the end. The Triple S Funky Remix has a simple disco-house riff as the phrase "The age of love..." plays overtop in a very club-friendly (and booty-shaking-friendly) track. Flanged guitars also make their way in to help provide the ultimate in disco grooves. Sadly, there's really no other reference to its source material other than the one spoken phrase, which is a shame. By the way, one of the Ss of Triple S is none other than Michael Simon, who would eventually become the third member of Scooter in 2006. The final remix is the Mad Man In Love Remix, which starts out with a dramatic spoken piece unrelated to the song and uses up a minute and a half of valuable time. We're eventually treated to jungle beats for a while, which is enjoyable briefly, but the melody of the song never really appears until almost the five-minute mark, which makes me wonder what we were waiting for. Luckily, it's in piano form and more beautiful and elaborate than Scooter's synth version. That made the wait worthwhile... sort of. The remainder of the remix is generic trance music that can be skipped. Scooter also tacked on their Original Video Edit for good measure. It's a shame that, as with most other remix compilations I've reviewed, the mixes featured are so far removed from their source material that the disc could pretty much go by any other name. It seems like this is not the Age of Love, but instead the Age of Generic Music. Aside from the Triple S Funky Remix (and the original), you might as well steer clear of this release.